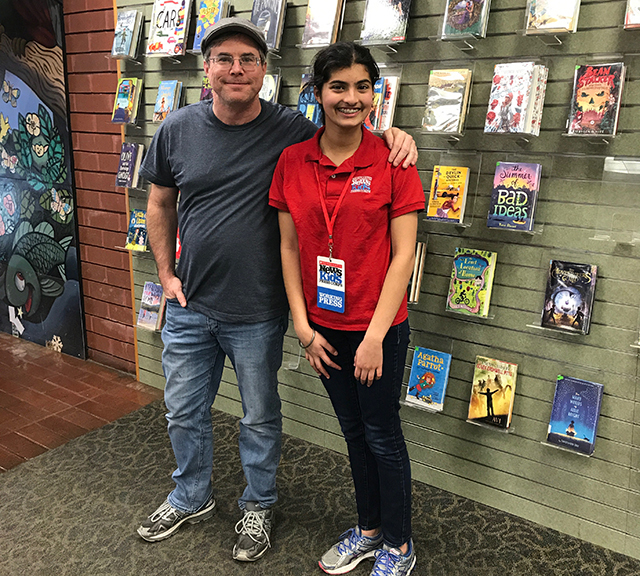 A Conversation With Andy Weir | Kid Reporters' Notebook | Scholastic Inc. If you like science fiction and math, Andy Weir’s sci-fi books are a must-read. Weir, who lives in San Francisco, California, is the author of The Martian and Artemis. Both novels are New York Times best-sellers. But writing wasn’t always easy for Weir. When he was in his early twenties, he couldn’t get his books published. In 2011, Weir self-published The Martian, his first novel under his own name. The book was picked up by a major publisher and became a best-seller. In 2015, it was adapted into a blockbuster movie starring Matt Damon and Jessica Chastain. The Martian is about an astronaut named Mark Watney who gets stranded on Mars in a dust storm and must find a way to survive. Weir’s latest novel, Artemis, is set in the 2080s in a city on the Moon. It tells the story of “Jazz” Bashara, a Saudi Arabian smuggler who designed the city, including its digital currency. I always wanted to be a writer. When I was 6 or 7 years old, I was writing fan fiction for Henry Huggins [a character in a book series by Beverly Cleary]. I was always writing, even when I was a computer programmer. Both The Martian and Artemis are set in outer space. What interests you about space? Science fiction, especially about space travels, is really fascinating to me. Those were mostly the kinds of books I grew up reading. I read my dad’s science-fiction collection that had books from the 1950s and 1960s by Robert A. Heinlein and Arthur C. Clarke. When you were writing The Martian, did you expect it to become so big? No, not all all. I thought that I was writing the book for a tiny, niche audience that I accumulated in 10 years of posting nerdy stuff on my website. I still don’t know how it ended up having such a mainstream appeal. How did you get the idea for Artemis, your latest book? I wanted to write a story about the first city that is not on Earth and decided that it had to be on the Moon. I designed the city and its economics. I had to go through multiple plot revisions before finding one that I liked. What has been the best part of writing? The best part is that I get to be a writer. This has been my dream my whole life, and now I get to do it full-time. It’s fun and awesome. First of all, to be a writer, you have to write. Until then, you’re just fantasizing and day-dreaming. The transition from the imagination to the paper is a rough and painful process, but that’s what writing is. When you actually start to write the story, you run into all kinds of problems. That’s good. You have to solve those problems.